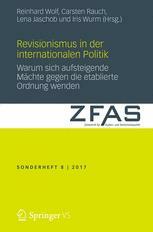 The results of our Resarch Project 4 “Rising, successful, dissatisfied – On the conditions of great power dissidence” (directed by Reinhard Wolf), have just been published in a Special Issue of the German journal Zeitschrift für Sicherheitpolitik titled “Revisionism in International Politics”. In the Special Issue, contributions by Lena Jaschob, Carsten Rauch, Iris Wurm, Johannes Sauerland and of course Reinhard Wolf discuss why rising powers resist the established order. This entry was posted in news on 3. February 2017 by Jannik Pfister. Maik Fielitz, associated researcher at the “International Dissidence” research group, and Laura Lotte Laloire have edited a volume on the extreme right in Europe. The volume, titled Trouble on the Far Right. Contemporary Right-Wing Strategies and Practices in Europe is just out with transcript. In Europe, the far right is gaining momentum on the streets and in parliaments. By taking a close look at contemporary practices and strategies of far-right actors, the present volume explores this right-ward shift of European publics and politics. It assembles analyses of changing mobilization patterns and their effects on the local, national and transnational level. International experts scrutinize new forms of coalition building, mainstreaming and transnationalization tendencies as aspects of diversified far-right politics in Europe. This entry was posted in news on 12. October 2016 by Jannik Pfister. Over the coming weeks, a blog series on social movements and institutions edited by Felix Anderl (from the Alterglobalization project), Jannis Julien Grimm (FU Berlin) and Jan-Philipp Vatthauer (HSFK) will be published on the leading German IR blog Bretterblog (in English language). Read on here or visit the IPB’s Working Group on Social Movements and Institutions. This entry was posted in news on 1. September 2016 by Jannik Pfister. We are looking for contributions for our upcoming conference on “Rule and Resistance in a Globalized World” (2-4 March 2017), where we plan to address the the relationship between resistance and systems of rule in times of transnationalization. You can find the full call here. We are looking forward to receiving your abstracts until 1 June 2016! This entry was posted in news on 26. April 2016 by Jannik Pfister. In the first week of May the Chair of International Relations and Theories of Global Orders, in cooperation with Asienhaus, Urgewald the Institute for Social Movement Studies (IPB), hosts three events to accompany the annual meeting of the Asian Development Bank (ADB) that takes place in Frankurt this year. On Tuesday, the 3rd of May at 5pm, there will be a lecture by Aram Ziai (Kassel, Germany) on “Can the subaltern file claims? The World BAnk Inspection Panel from a postcolonial perspective”. The same evening at 7pm, Titi Soentoro (AKSI, Indonesia), Rayyan Hassan (NGO Forum on ADB, Philippines) and Chris Lang (REDDMonitor/Asienhaus) will present the impact of ADB-projects in the contexts of gender, rights and environment. On Friday, the 6th of May there will be a day-long workshop by the IPB’s Working Group on Movements and Institutions on the interaction of social movmements with international organizations. For this workshop we ask you to please register under anderl@soz.uni-frankurt.de. This entry was posted in news on 15. April 2016 by Jannik Pfister.